Pope Francis has used the words of St Oscar Romero to welcome young people to the official Opening Ceremony of World Youth Day at Campo Santa Maria la Antigua on the Cinta Costera in Panama City. 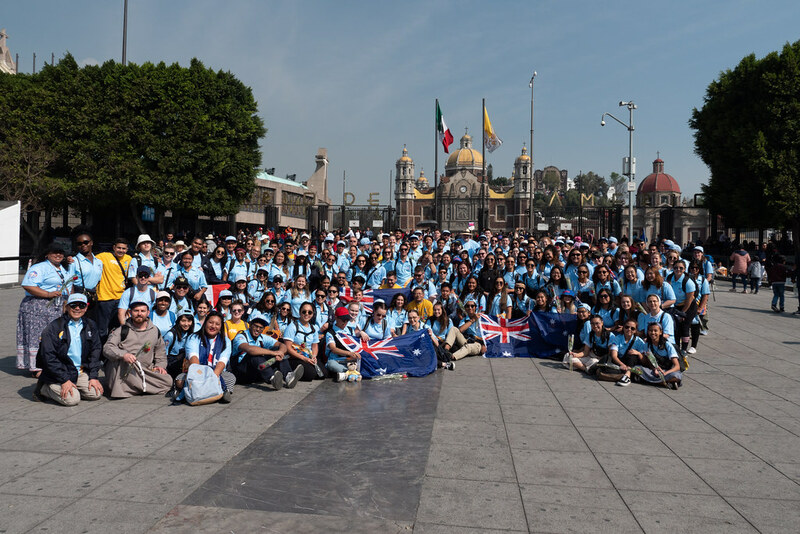 Diocese of Parramatta pilgrims lined the streets with over 100,000 other pilgrims hoping to catch a glimpse of Pope Francis as he made his way down the Panamanian esplanade toward the host site. The Opening Ceremony with the Pope marks the first of four major opportunities pilgrims will have to hear the Pope speak. In his address the Holy Father commended young people for their effort and sacrifices they made to get to Panama. Diocese of Parramatta pilgrims wait for Pope Francis during the Papal Welcome in Panama City. Image: Diocese of Parramatta. The concepts of movement and not stagnating were a common theme not only with the Pope, but also other Bishops who have preached at World Youth Day. On Wednesday evening, many pilgrims ventured to the FIAT centre for an evening of adoration hosted by FOCUS (The Fellowship of Catholic University Students), the USCCB (United States Conference of Catholic Bishops) and the Knights of Columbus. Bishop Robert Barron, Auxiliary Bishop of Los Angeles said that “when Christ comes into your life, he wants you to ‘put out into the deep’ duc in altum (Luke 5:4). Bishop Robert Barron, Auxiliary Bishop of Los Angeles, speaks during the WYD FIAT session in Panama City. Image: Diocese of Parramatta. In his Thursday catechesis Bishop Alan Williams SM, Bishop of Brentwood, UK told the English-speaking pilgrims that the greatest sin is despair. “Saints change a lot, you move forward (in the spiritual life), you will feel tired” and he encouraged pilgrims to be different when they come back. Whilst Diocese of Parramatta pilgrims were at the local catechesis, Bishop Vincent Long OFM Conv was addressing other groups of Australians and Croatians at another Catechesis sessions. These sessions are hosted in many different locations across Panama City in different languages. Bishop Vincent Long speaks during a catechesis session on Thursday in Panama City. Image: Diocese of Parramatta. Friday will be the final day of Catechesis for the pilgrims before Stations of the Cross in the evening.